BOSTON — National touring productions are like Forrest Gump’s box of chocolates: You never know what you’re going to get. So it’s good news that the national touring production of “Annie” at the City Performing Arts Center’s Wang Theatre is a grand, glorious return of the classic musical to Boston. A standout cast, including a bunch of orphans who register an 11 on a scale of 10 on the Cute-o-Meter, makes this the perfect chance to see “Annie” for the first or the seventh time. This production was directed by the show’s original lyricist and director, Martin Charnin — directing his 18th separate production of this legacy musical — and the love and care shine through in all aspects of the show, from the adroit casting to the no-expense-spared production values lavished on the tale of the spunky orphan who finds happiness in the unlikely form of a billionaire industrialist. 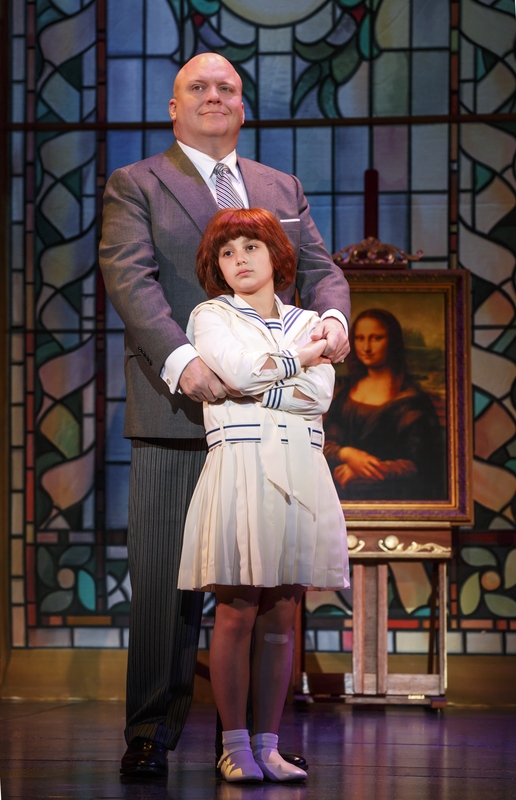 Issie Swickle and Gilgamesh Taggett in the national touring production of “Annie.” Photo: Joan Marcus. It is Chritsmastime 1933, in the depths of the Great Depression, and an 11-year-old orphan named Annie still awaits the return of her parents, who dropped her off at the New York City Municipal Orphanage soon after her birth with a locket and a note promising to return. She has been holding onto that note and the locket (“Maybe”) ever since, dreaming of the day she’d finally be reunited with her parents. Issie Swickle has all the qualities you’d want in an Annie — brimming with confidence and charisma, and a voice that might reach the last row of the cavernous Wang even without a microphone. She’s in sync with whomever she’s acting with, be it the other orphans — Lily Mae Stewart, Adia Dant, Isabel Wallach, Angelina Carballo, Lillybea Ireland, and Sydney Shuck — Miss Hannigan (Lynn Andrews), the odious caretaker of the orphanage, Daddy Warbucks (Gilgamesh Taggett) or President Franklin Roosevelt (Allan Baker). Taggett oozes bonhomie and warmth as Warbucks, who rescues Annie from the orphanage and he’s both a skilled dancer and singer, and his chemistry with Swickle is strong. Ashley Edler and Todd Fenstermaker add solid support as Grace Farrell, Warbucks’ lovely secretary, and Drake, the head of his household staff. The production values are top-notch everywhere you look, and far above those of almost any national tour I’ve seen in recent years. 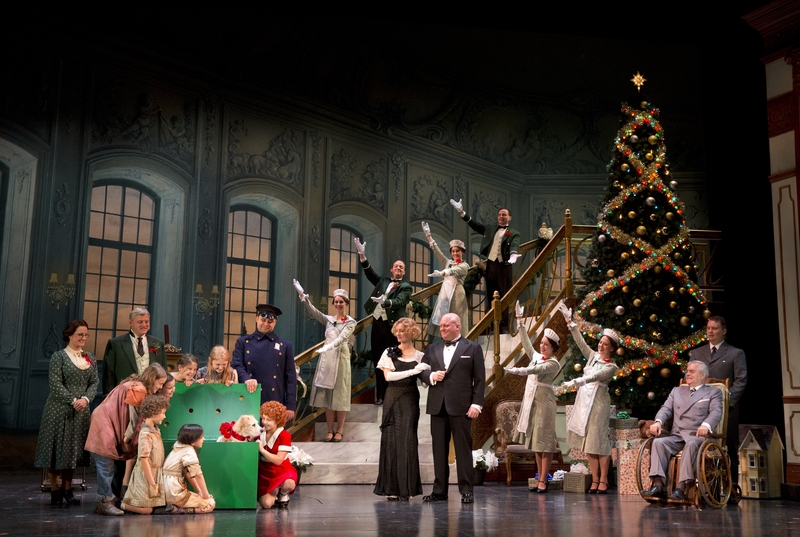 The revamped look includes delightful sets by Tony Award® winner Beowulf Boritt, lovingly re-creating Manhattan skyline and other NYC landmarks, the New York City Orphanage, the Daddy Warbucks’ opulent office and mansion and the heart-warming Christmas scene. “Annie” may be 37 years old, but in this reincarnation she still shines like one of those bright bulbs on Oliver Warbucks’ towering Christmas tree. The Troika Entertainment production of “Annie.” Book by Thomas Meehan, music and lyrics by Martin Charnin and Charles Strouse. Based on the comic “L’il Orphan Annie.” Directed by Charnin. Scenic design by Beowuld Boritt. Choreography by Lisa Gennaro. Music direction by Keith Levenson. Costume design by Suzy Benzinger. Lighting design by Ken Billington. Sound design by Peter Hylenksi. Sandy trained by William Berloni. At the Citi Performing Arts Center Wang Theater through Nov. 16. http://www.citicenter.org.